Home / Cars / How Much Does Motorcycle Insurance Cost? Anyone with a bike will tell you that there is nothing like being out on the open road. Call it freedom, call it a thrill, or maybe just cheap transportation, a motorcycle is a true joy to drive. But like any other vehicle, you have to have insurance to drive it. Motorcycle insurance is there to cover you, your bike, and the property of others. There are state minimums for motorcycle insurance but you can also get additional coverage. However, not all insurance agencies offer insurance for motorcycles, considering them to be too much of a high risk. Provided that you find an agency that offers coverage, how much does motorcycle insurance cost? Well, there are a lot of factors involved but motorcycle insurance can run you anywhere from $50 a month to $400 a month. Those are the most extreme numbers. You are probably looking at an average spread of $150 to $250 a month. So why such a big difference? What are some of the factors involved? Before you go out and buy the first insurance policy you find, here are some things to consider. The truth is there is not one set price for motorcycle insurance. There are simply too many factors that affect the price. For instance, a big factor is the age of the driver. The younger the driver, the more expensive the premiums. Young drivers have less experience and tend to drive faster, especially on a motorcycle. Another factor is the make and model of a motorcycle. If the motorcycle is an older model, say a Honda CRF, then the premium will probably be lower. But if the bike is a brand new street bike like a Yamaha YZF-R1 then the premiums will be higher. Just like sports cars that are designed to go fast, a high performance street bike is going to be more expensive. The state that you live in can also be a factor when trying to find the best motorcycle insurance. States have different laws and requirements for vehicle insurance which can affect prices on different policies. Your insurance agent should be aware of state requirements but it isn’t a bad idea to do a little research yourself to find out what is required. Your driving record and your credit history play a big role in determining your insurance rates. Naturally, if you have been involved in several accidents or have a collection of traffic tickets, you are going to be considered a higher risk. This means that your rates will be higher. The same applies for your credit history. If you have bed credit, you will be a risk because insurance companies will think that you can’t pay your bills on time. The minimum requirement for motorcycle insurance in any state is a liability coverage. Liability insurance is designed to cover any damages or injuries to another person or their property in case of an accident that is deemed to be your fault. The importance of liability is to not only cover the expense of an accident, but also to protect your assets from a lawsuit. Liability coverage will not protect you or your motorcycle but it is cheaper that comprehensive (or full) coverage. If you want to protect yourself and damages to your motorcycle, you need to get additional insurance coverage. Depending on the insurance company, comprehensive coverage can usually be customized to fit each motorcycle owner’s specific needs. Comprehensive insurance costs more than liability but offers more protection. Comprehensive collision can protect your bike from damages it may receive from an automobile accident, vandalism, or bad weather. It also covers your bike in case someone steals it. Uninsured motorist coverage is an additional policy that can help you out if you are involved in an accident that was the fault of an uninsured driver. Uninsured motorist coverage can pay for medical costs for you as well as pay for damages to your bike. Guest passenger liability coverage is another useful (and recommended) policy. You see people riding bikes all the time and there is someone sitting behind them. Guest passenger liability can help protect anyone riding with you by paying for medical costs if they get into an accident. Before you go out and sign up for the first policy you find, here are some tips for getting the best rates. The most important thing is to shop around. First try your insurance agent that covers your house and any other vehicles you might own. See if they offer motorcycle coverage and if so, how much is the premiums. If they do not, then you need to look elsewhere. If you are considering buying a new motorcycle but have not made the deal yet, you need to think the expenses of insurance and what you can afford. Scooters and older bikes may not be as cool as a Harley but they are cheaper to cover. The more expensive the bike, the faster it goes, the higher the insurance is going to cost you. Once you have your bike, make sure you get enough insurance to cover the extras. Regular insurance policies will only cover the original factory parts. If your bike is a custom job, additional chrome parts, or has a fancy paint job, take that into consideration when purchasing your insurance. Before you buy insurance, ask the people who regularly ride motorcycles who they have their policies with. If you buy your motorcycle from a dealer, you can ask them where to get insurance. If there is a motorcycle club in your area, go talk to the guys (or girls) who are members. They should know where to get the best policies. You might even join the club if they have any group discounts. If your motorcycle is considered a classic model, check with the insurance company to see if they have appropriate insurance. Policies for classic bikes are sometimes cheaper because owners usually take good care of the bikes. 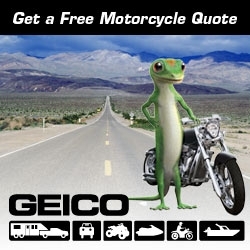 Geico, American Modern Insurance Group, Nationwide, Esurance, State Farm, Allstate, and Progressive Auto Insurance. You can get quotes from each company and decide which has the best policy for you.